I resist the myth of the lone genius. I collaborate as a means of expanding performances beyond what I’m capable of producing alone. I oppose the model of isolated authorship. Instead, I’m excited by breakthroughs innovated through collaboration. This democratizing of leadership leads to a cultivation of my own voice and of those with whom I work. My interest is in people, not in codified or imposed aesthetic. My process is an exploration of the people in the room as opposed to outside ideas with a particular group of people. I cultivate a space that supports myself and my collaborators being our full selves to explore aspects of being human that are impossible to inhabit in every day life. In this way, we’re able to delve into the hidden and vulnerable parts of our identities and bring them to the fore. 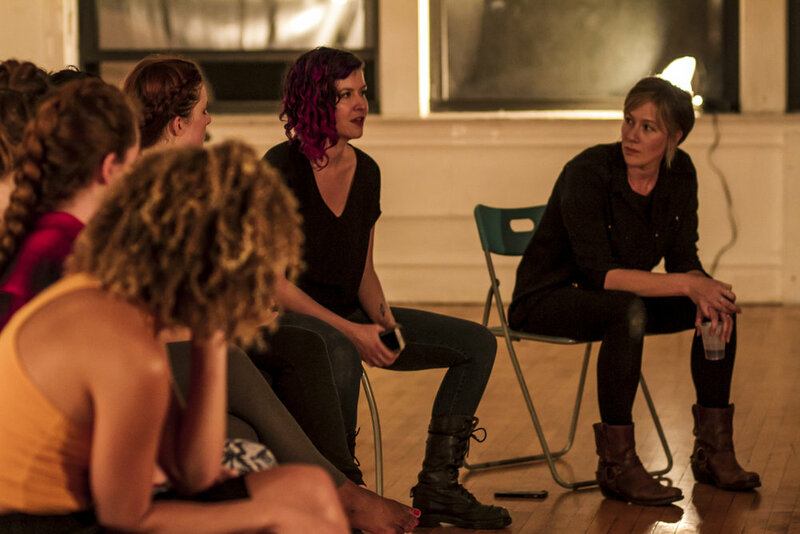 With a genuine commitment to opening up to what’s happening in the room, the dances we create are a result of following the threads of these relationships. My collaborative process strips superficiality. As we dive into our underbellies, the resultant performances become other-worldly. This provides a structure to support these characteristics that don’t traditionally have a place in every day society. This process is radically supportive of a more fully realized experience of our being. This offers the potential to transform how we move through the world.